Some history... Commercial wireless Radio Teletype (RTTY, sometimes pronounced as "ritty") communication with electromechanical teleprinter machines dates back to the1930s. RTTY was standard during the second Worlds War. The bulky and noisy US military and commercial surplus equipment (keyboard terminals, teleprinters, punch tape perforators, etc.) became the main equipment for the RTTY radio amateurs right after the war, until microprocessors made their arrival in the 1970s. Noisy selector magnets used in mechanical decoders to detect the status of the loop current (mark and space), tape readers, perforators, loop power supplies, were all replaced by a small chip, that made all jobs better. Devices like HAL DS3100, consisting of an electronic keyboard, a monitor and the modulator-demodulator ("modem") were not uncommon in a Ham shack, and the easy-to-operate equipment made more amateurs active in RTTY operation. These days, (de-)modulation is typically done with freeware on a PC, using the PC's soundcard. Sometimes RTTY is incorrectly referred to as "telex", which is actually a teleprinting exchange, i.e., an exchange-based switched network service, enabling communication between teleprinters. teletype punch-tape for "the quick brown fox jumped over the lazy dog back 1234567890 end test"
Mark and Space. Nowadays, RTTY and Frequency Shift keying (FSK) are considered synonymous. However, RTTY was not FSK until after 1933, when H.C.A. van Duuren and A. Bakker of the Dutch P.T.T proposed the use of two-tone FSK for RTTY. At the same time, they also proposed Automatic Repeat Request (ARQ), for characters with corrupted signals. See ref. 4. A two-tone RTTY transmitter sends out a continuous carrier that shifts frequency back and forth between two distinct frequencies. There is no amplitude modulation, only a pure carrier similar to CW with the addition of a frequency shift. The lower RF frequency is known as the SPACE frequency and the upper RF frequency is known as the MARK frequency. The difference between the two is known as the SHIFT. For amateur radio, the SHIFT has been standardized at 170 Hz. This allows sharp 250-500 Hz audio filtering. It is customary to refer to the MARK frequency as the frequency you are operating on. For example, if you say you are transmitting on 14080.00 kHz, that means your MARK frequency is 14080.00 kHz and your SPACE frequency is 170 Hz lower, or 14079.83 kHz. Some stations use a shift of 200 Hz. Weather stations often use 50 or 75 baud, and a 450 Hz shift. Sound-clips of RTTY signals with several shifts and Baud-rates are on my "Digi-modes sounds & spectra" page. FSK and AFSK. FSK stands for Frequency Shift Keying and AFSK means Audio Frequency Shift Keying. With FSK, the transmitter shifts its carrier frequency back and forth between Mark and Space. With AFSK, the transmitter sends separate audio tones for Mark and Space (basically via the microphone input of an SSB transmitter). The station receiving the RTTY signal cannot tell the difference. The difference is the way the transmitter generates the RF signal. The recommended audio frequencies are 2125 Hz for the MARK audio frequency and 2295 Hz for the SPACE audio frequency. Note that the SPACE audio frequency is higher than the MARK audio frequency - just the opposite of the RF frequency of the actual transmission. This happens because amateur radio RTTY uses lower sideband (LSB) transmission. If you happen to forget and set your transmitter to USB instead of LSB, two things will happen. Because your MARK and SPACE are now reversed in your receiver, any RTTY signals you hear will not print correctly. All you will see is random characters that make no sense at all. Modern RTTY software has simple controls to reverse received signals. Note that USB is used in some parts of the world, especially in Europe. Figures Shift and Letters Shift. RTTY uses the Baudot code, invented before radio even existed, and still widely used throughout the world. The Baudot code uses data bits to represent letters, numbers and punctuation, much like a computer does. Unlike a computer, which uses one byte (eight bits) for each character, the Baudot code uses only five bits, plus a start bit and stop bit. Using fewer bits is good because it speeds up transmission and reduces the chance of errors, but there is a complication. Five data bits can only represent 32 different characters. Since there are 26 letters in the Latin alphabet plus ten numbers, plus some punctuation, 32 different characters is not enough, even if you only use capital letters, as does the Baudot code. Rather than using more bits, Mr. Baudot came up with an other solution. He reasoned that most of what would be sent would be letters rather than numbers or punctuation, so he assigned all the letters to the basic 32 characters. He then had six possible characters left over, and did a very clever thing with two of them. He made one of them a Figures Shift and another a Letters Shift. When sending one of the basic 32 characters, nothing special happens. But when a number or punctuation is to be sent, the Figures Shift character is sent first (it's a non-printing character). Whatever follows will still be one of the basic 32 characters (bit patterns), but the receiver will interpret it differently. For example the letter Q uses the same five data bits as the number 1, but when the receiver gets a Figures Shift first, it prints the next character as a 1, not a Q. This continues until a Letters Shift character is received, at which time the receiver goes back to "normal" printing. Characters may get corrupted due to interference from lightning, static, man-made noise, channel fading, etc., causing inadvertent letter-figure shifts. Modes. As discussed in the above introduction, RTTY data transfer is subject to distortion and interference. This has led to the expansion of RTTY with Automatic Repeat reQuest (ARQ) to guarantee delivery. One such basic mode is SITOR: Simplex Telex Over Radio (used in marine communication). The ham radio equivalent of this is AMTOR: Amateur Teletype Over Radio. The transmitting station sends three characters then waits for a response from the receiving station (at a different frequency). The receiving station sends an ACK ("acknowledged", signifying "send the next three characters") or a NAK ("not acknowledged", signifying "repeat the last three characters"). This exchange of ACKs and NAKs helps to ensure that only error-free text arrives at the receiving station. PACTOR is a packet-like mode based on AMTOR, but with slightly longer packets and AX.25 protocol compatibility. This mode is much faster than AMTOR. G-TOR is a 600 baud mode that uses Golay FEC (Forward Error Correction) coding. 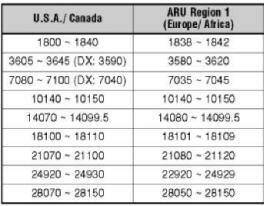 Amateur radio RTTY frequencies. It is easy to remember the ham radio band plans for RTTY: most activity will be found between 80 and 100 kHz up from the bottom edge of the band, except on 80 meters, which goes an additional 40 or 50 kHz higher, and on 160 meters. 160 meter RTTY activity is rare, but when found, it is usually between 1800 and 1820. Avoid the CW DX window between 1830 - 1840. At present, there is not much activity on the WARC bands, although 30 meters can be active at times. RTTY allocations for 40 meters vary greatly all over the world. In the US, RTTY is permitted between 7000 and 7150, although most US activity is between 7080 and 7100. DX activity is often found between 7020 and 7040. 24/7 Internet-RTTY streaming news broadcast (requires WinAmp or RealPlayer); alternatively, you can listen to it via Shoutcast channels, e.g. here.